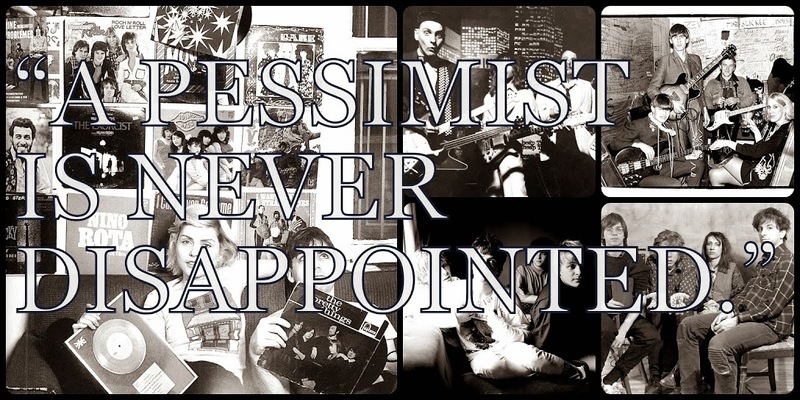 A Pessimist Is Never Disappointed: The Past Is Another Country: A Review of The 2nd Dot Dash Album and a Free MP3! 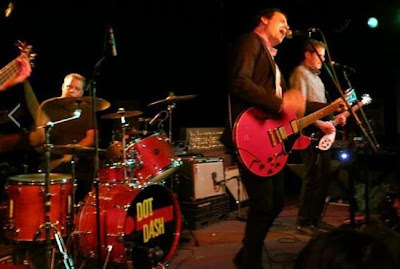 The Past Is Another Country: A Review of The 2nd Dot Dash Album and a Free MP3! It seems like a lifetime ago and yet it was less than a year ago. There I was standing backstage talking with three of these guys about my impending move to Hong Kong and now here I am, riding a ferry off Lamma Island and listening to Danny Ingram's sticks kick off the lead track on the new Dot Dash record, Winter Garden Light, out now on The Beautiful Music. 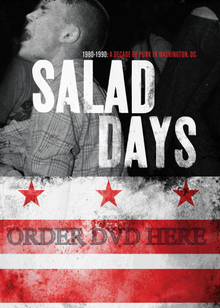 It's not only the fact that these four guys collectively and individually represent so much D.C. rock history -- see my interview with drummer Danny Ingram here and my interview with lead singer Terry Banks here -- but, rather, that they do it so well with such little wasted effort. 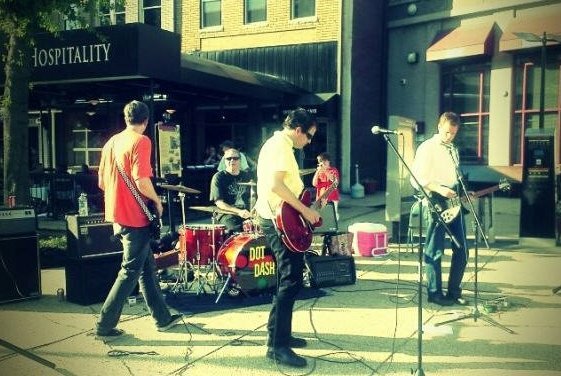 The 10 cuts on Winter Garden Light rocket by in a stomp-and-flurry of guitar riffs, bass thumps, and drum pounds. It's like these 4 guys heard about a "going out of business sale" at the ye olde postpunk store and they went in and grabbed everything they could use before tossing a match behind them. The famed D.C. punk fury is here -- how could it not be with Youth Brigade's Danny Ingram on the skins? -- and that sense of a pop hook as well -- go listen to Terry Banks' stuff in Julie Ocean (with D.D. bassist Hunter Bennett) and try to get those tunes out of your head quickly -- but that fury and those hooks are judiciously dispersed in a controlled release of postpunk joy. Like when you listen to The Buzzcocks and Cheap Trick and think how perfect "Lipstick" or "Surrender" are and then survey the pieces and try to figure it out. Dot Dash have those pieces and they've already figured it out so let's talk about the new tunes. "Faraway": through fuzzy guitar riffs and heavy drums, this opening cut soars. Some nice background coos and the track puts a new spin on the Dot Dash formula from the first record. 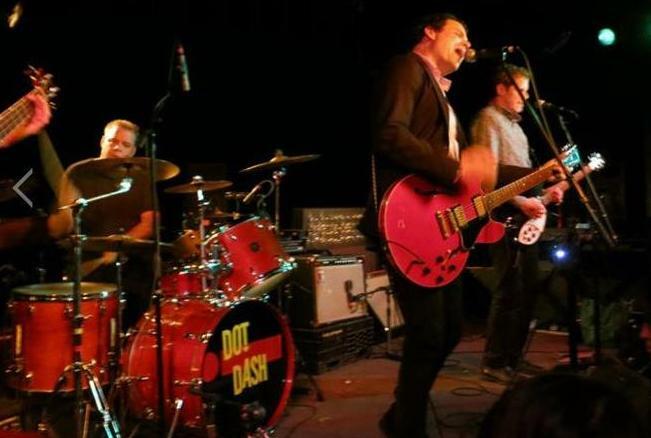 There's a hint of mod-era Who here but what we're really hearing is a spin on "The Place I Love" by The Jam -- Dot Dash are opening for From The Jam in October -- it's like a rough twin of that tune. The harmonies are back on "Countdown" which is, quite possibly, the loveliest Dot Dash song out there. "10, 9, and down to 1, the countdown has begun..." Terry croons. Guitar-slashes and fuzz-wails are mixed with a plucked, nearly Edge-like little riff, and "Countdown" charms. A very modern turn on an Eighties-style rocker, this is a really perfectly constructed tune. If you are going to put just one song from Winter Garden Light on a mix-tape, put "Countdown" there between "All That Money Wants" from Psychedelic Furs and "Over There" by The Connells. "Two Octobers" opens ominously with those heavy drum thumps and those slow somber Banks vocals. Then the song kicks off in a spiral of Byrds-licks from Bill Crandall and Terry Banks. The cut contrasts those two halves of the band to produce something vaguely like the best work of The Buzzcocks with a hint of The Records. "Writing On The Wall" opens with a rapid-fire run on the drums from Danny Ingram and some Hunter Bennett bass-throbs. The croons are back as Terry sings "I won't fight the good fight, I won't stay the course." 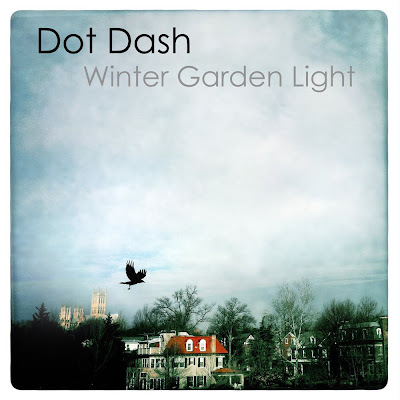 This track -- like a lot of the best stuff on Winter Garden Light -- shows how far the band have come from the last record last year. The pieces are the same but there's more cohesion this time around, more melody, a greater sense of the band playing to their individual and collective strengths. "La-La Land" is like Julie Ocean's stuff but harder. The croons are here, as well as the hooks, but there's something dark at work. It's like if Jawbox tried to record a Marshall Crenshaw song, you get what I mean? I dig that contrast and I dig this record! A fade-out jam echoes Bob Mould's Sugar stuff for a few seconds. "Live to Tell" is The Raspberries by way of Husker Du. Some weird mix of punk and power-pop, this tune is one of the obvious standouts on Winter Garden Light. That glorious little cut segues neatly into "The Past Is Another Country" -- Free MP3 Below! -- and the Who moments are back by way of Clem Burke. The best pop bits from Blondie mixed with a Buzzcocks vibe -- think "Airwaves Dream" maybe. The punky "Shouting in the Rain" cranks along next. More Moon-isms from Danny in spots but the song really succeeds due to the mixing of those drums with the guitars and bass here. A spike-y guitar line and more quick fills. 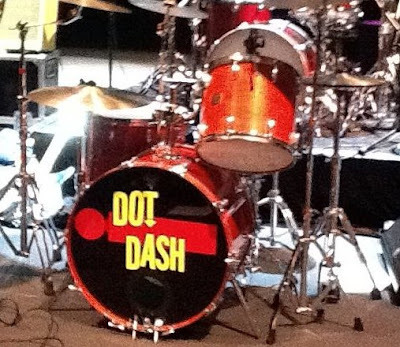 A nice encapsulation of the strong musicianship of Dot Dash, the cut is -- as I know -- a really good live showcase for the band as well. "Lateral/Vertical" is the slowburn, the vocals sounding a bit somber until the chorus takes off. The churning guitar/bass-work behind Banks really makes this a strong cut. There's a touch of Swevedriver here which makes sense since Danny Ingram was their drummer for a spell. Album closer "The Devil's Road" features some downright amazing guitar-work from Banks and Bill Crandall as well as the ever-reliable work of the rhythm section of Danny Ingram and Hunter Bennett. If the Terry Banks vocals sound a bit different, that's okay. The tune still charms and shows yet another side of the band. I'd say that the Dot Dash sound was shaped on the first record, refined on most of this album, and pointed in a slightly new direction on "The Devil's Road." Winter Garden Light is a sleek machine. 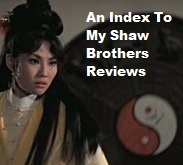 It's solidly produced (Brandon Funkhouser at Lord Baltimore Studios) but it's not slick. The human bits are still there. It's got punk energy embedded in its 10 cuts but it's not a record of rage. It's a record of joy. There's a sense of tension-and-release here. 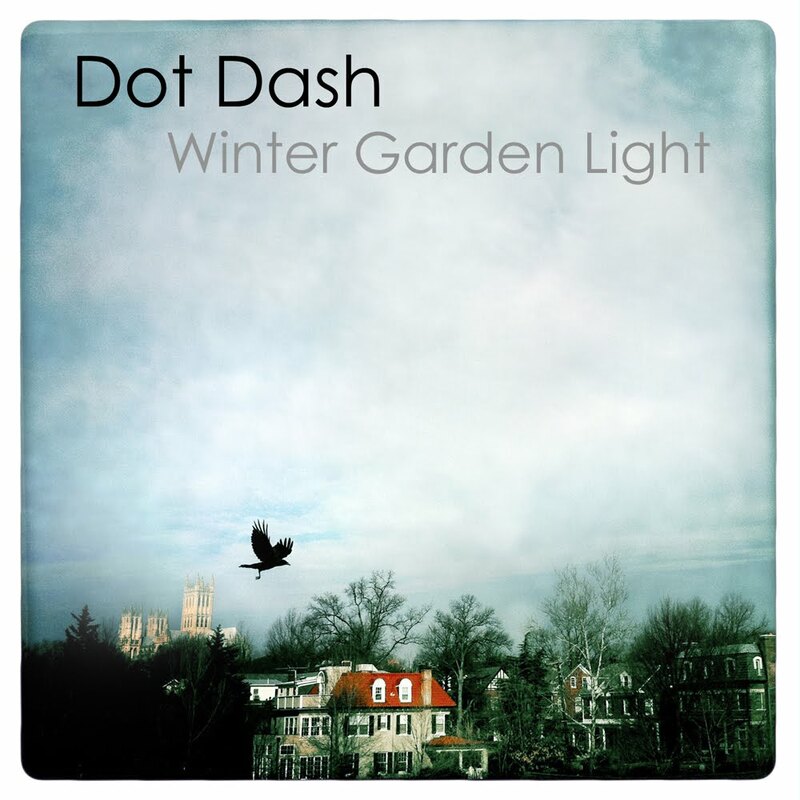 Winter Garden Light is the real refinement of what makes The Dot Dash Sound and, suddenly, the band sounds more assured and of one piece, if that makes any sense. They've harnessed their respective pasts -- Dischord influences, powerpop and ska time, and indie hooks -- into something new. Sure, there are nods to those pasts but this is really fresh and modern music. Download "The Past is Another Country" here!